Over the Easter long weekend, we headed down south for my niece’s Naming Ceremony, and an engagement party for my sister, Shandelle, and her fiance, James. So I’ll be honest and say I had an inkling that they were going to have a surprise wedding. I didn’t want to say anything to my sister and spoil the surprise, but there were quite a few hints that it was not just an engagement party, like my sister having a hair and make-up person coming to the house that morning, and my Mum calling me a few days beforehand asking if I knew where our family “wedding bracelet” was (more on that later). Shandelle asked me to be their photographer for the day, so I went armed with a new 28Gb memory card, ready to capture whatever the day brought. I arrived early (sans children and husband), so I could take photographs of my sister getting her hair done, and of the decorations and cake, and a few of my nieces, Madeleine and Elyse. 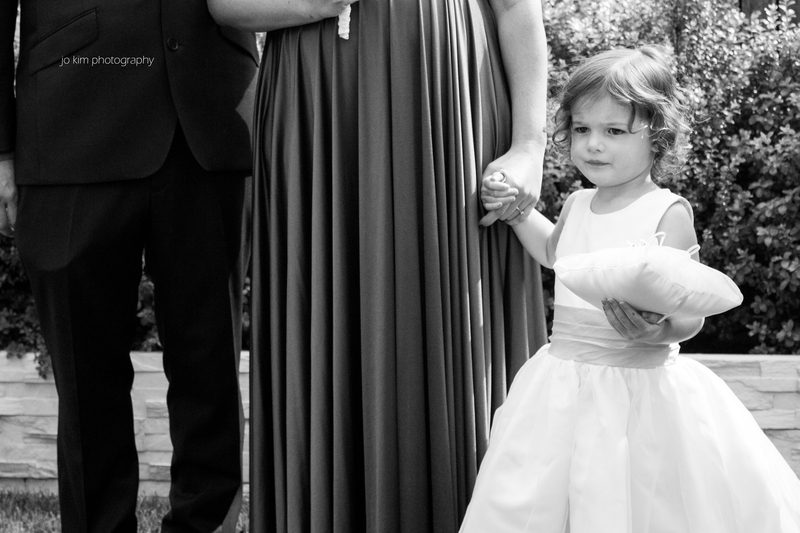 I also wanted some photos of Elyse with her Godmothers: our cousin, Lisa, and my very old friend (and my old housemate! ), Kylie. 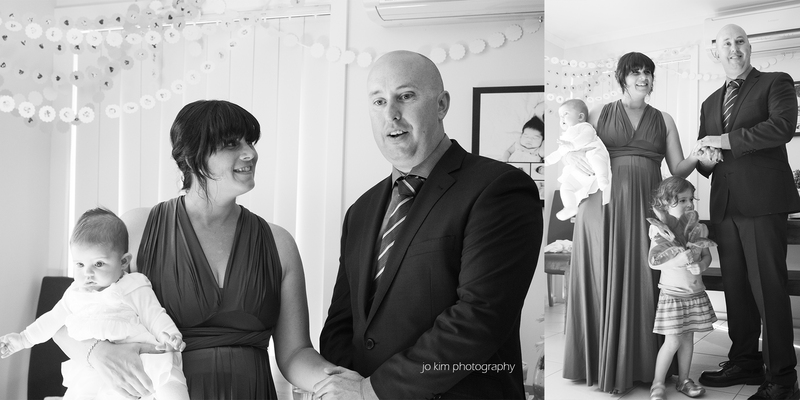 The Naming ceremony went off without a hitch, and we all formally welcomed gorgeous Elyse to the world. After the naming ceremony, James came and fetched me and Kylie, with a “Surprise! We’re getting married now, come and help us get ready!”. Kylie helped Shandelle into her twobirds dress, while I snapped some shots of her awesome bouquet and the rings. Dear heart, Madeleine, unfortunately did not wish to change into her pretty flowergirl dress and provided a small paddy for us, but Shandelle and Kylie managed to convince her in the end. The “wedding bracelet” – my Pop, who passed away in 2010, gave this gorgeous bracelet to my Nan before they were married. It has since been worn by my Nan, my Mum, my aunt, my sisters and me on our respective wedding days. 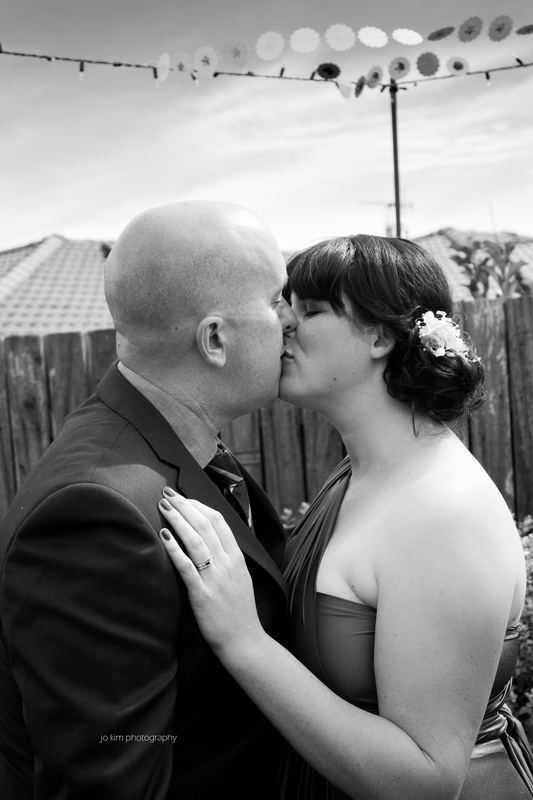 I was the last to wear it on my wedding day almost six years ago, and since then it was returned to Nan. Unfortunately, since Pop passed away, my Nan has developed pretty severe dementia. So when Mum tried to find the bracelet in the week before Shandelle’s wedding, Nan had no idea where it was, and Mum couldn’t find it anywhere. Hence calling me to see if I knew where it was. Under the pretense that they were “just going through Nan’s jewellery box and can’t seem to find it”… No one could work out where it had gone, but then strangely enough, two nights before the wedding, my Nan walked into my aunt’s house wearing the bracelet. She wasn’t able to remember where it had been or when she’d found it, but thankfully, it was there for Shandelle to wear and carry on the tradition. 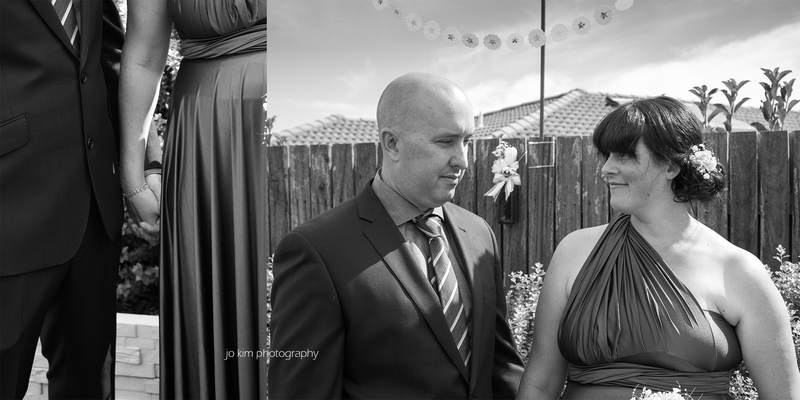 Shandelle and James had a wonderful, relaxed, casual, sometimes barefoot, wedding, which just fitted both of them perfectly. My awesome extended family were all there, and we partied into the night. I absolutely adore seeing my family. 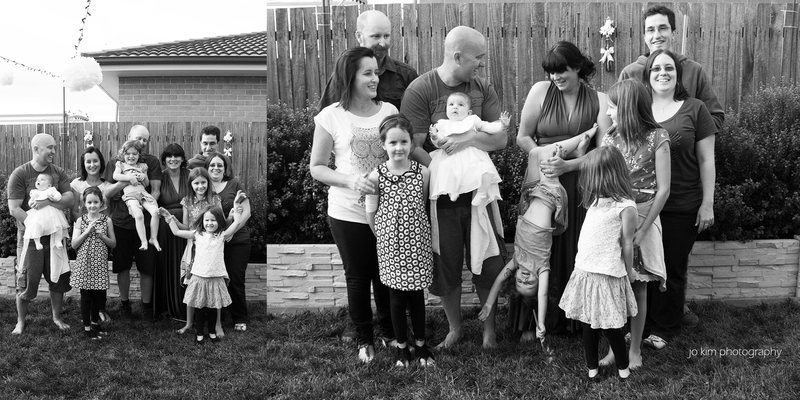 We celebrated my Nan’s 90th birthday that weekend, our matriarch, who has four children (plus their respective partners), who have twelve children between them (including me), and now there are 8 (and a half) great-grandchildren in the mix also. A large majority of the family is female. And short. I’m one of the tallest, and I was one of the shortest girls in my year at school. 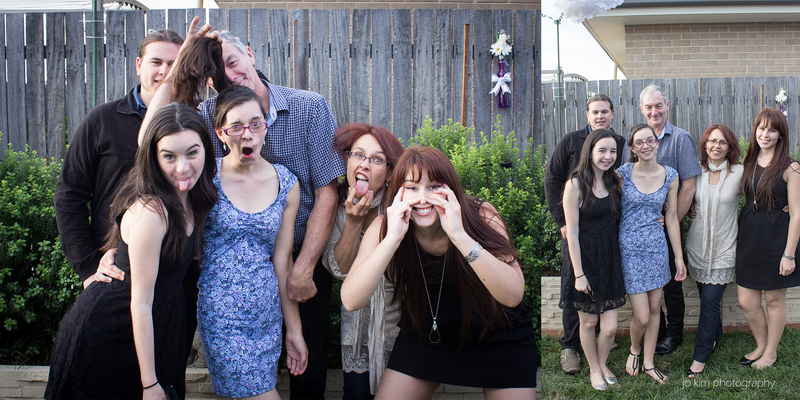 My cousins are all really photogenic, which makes for great party photography. And while we only get to be all together once a year or so these days, everyone gets on like a house on fire. 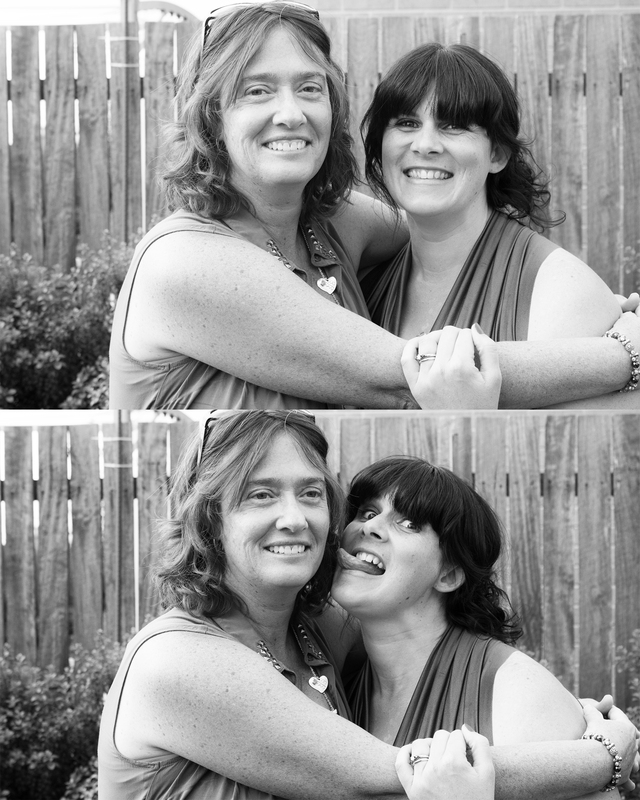 I think I’ve been unnaturally blessed with my family. And so, many, many photos of the day were taken… Here are some of my favourites.